Whilst working on Sufi Spirit, the theme of love emerged as something concrete and essential at a time of tectonic political shifts in the global landscape. As European and American voters seemingly ratchet to the right, Stephan Grabowski speaks with passion about the need to offer an alternative narrative. One of cross-cultural understanding and love shared between normal citizens rather than the divisions encouraged by 'political leaders who whip up discontent'. That comes from a sleeve essay that challenges comfort zones for a new album that also challenges comfort zones. Sufi rock has had some distinguished advocates, starting with the band that pioneered the genre, Junoon from Pakistan. 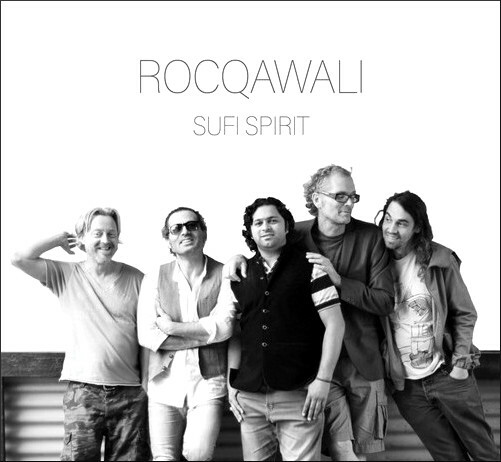 Rocqawali's Sufi Spirit gives the genre a new twist with its line-up of Danish drummer Stephan Grabowski, Danish/ Pakistani guitarist and sitarist Jonas Stampe, Iranian-born guitarist Tin Soheili, and luminary of one of Pakistan's legendary Qawali dynasties Ejaz Sher Ali. Although Sufi Spirit is clearly not aimed exclusively at the Muslim market, that opportunity is not be sneezed at. The Muslim music market is forecast to reach US$1.4 billion dollars and is driven by that holy grail of music marketeers, a young demographic Two-thirds of Muslims are under the age of 30 and many of these are on the doorstep of the West in the Middle East-North Africa (MENA) region south of the Mediterranean*. While classical music struts its celebrity stuff for ageing Western power-brokers in Vienna, why not kick out the cultural comfort zones with this video of Rocqawali's take on the Sufi anthem I'll Allah. * It also should not be overlooked that within the MENA region are approximately 60% of the world's oil reserves and 45% of the world's natural gas reserves. 'Thanks for your insightful post today. You must be scanning the world’s media all the time to find these things. I’m not a huge Qawali fan as I’ve seen so many in the past which I didn’t like too much. But this has an intensity which I can only envy. Ricqowali made me think of U2 on Qawali steroids. And they weren’t kids either. Truth is I didn’t dislike it which for me and my snooty music opinions is a way of conceding that it was pretty good. More strength to their elbow.